Spocon is the con that birthed our career, and we will ever be loyal to it. That said, Radcon is always a blast, and this year was no different. I signed up for my panels by issuing a challenge to the programming director: “I dare you to try to break me.” Well, Liz Vann-Clark gave it her honest shot, but the result was some of the most fun I’ve had at a con. Friday started off pretty regularly; I did a panel about privileges in society. It was cool, Kaye Thornbrugh was on it and it’s always great to see her again. We’ll be posting a review of Brightly very shortly, though I’m sure it’s up to Kaye’s normal high standards. After that, though, things got awesome. I did the “Picture This!” panel. On said panel were three artists and three authors. The authors brought a piece of writing and read it; the artists drew a sketch based on what they were hearing. It was a rush-job for the artists, and I was amazed at what they were able to turn out in (say) about ten minutes per author. One of the artists was the Art Guest of Honor, Howard Taylor of Schlock Mercenary. All well and good; after Picture this I hung out in the Green Room with Manny Frishberg and a couple of other old friends. Then my evening began. In her first real run at breaking me, Liz Vann-Clark scheduled me onto two back-to-back panels entitled “Polyamory Revival” and “50 Shades of Consent.” The titles of these panels leave little to the imagination. Now, I’m a straight, cis-hetero, vanilla white male who’s been in a stable relationship for a little over fifteen years. I’ve got nothing against people who aren’t; as long as we’re talking about consenting adults, I say have fun. I do what works for me. That said, it’s a little strange being place as an expert on a panel about things in which I have not participated. Still, Luna Lindsey (whose Emerald City Dreamer we’ve reviewed previously) and company were nothing if not sporting, and I still managed to have fun. Saturday was a blur. Seven panels in a day will do that; they went by one after the other. Many were full, many postcards were handed out; maybe, just maybe someone will buy our book (fingers crossed). I did another panel the subject of which I had no clue (this time: Cryptozoology), and received a very nice compliment from an audience member afterward. So at least I faked it well. All in all, RadCon was a hoot. What little nerves I had about being a panelist are simply gone now; I wore them away through sheer volume of panels on this one. Good times, all. Some news I learned: Sky Warrior Books is going to, in the next year or so, be releasing all its works as paperbacks. 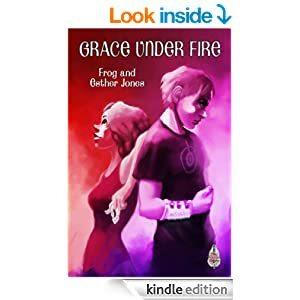 For those of you looking to snag a paperback copy of Grace Under Fire, this is your chance. Also, Coup de Grace is going to be out shortly, so look forward to that. Finally, going to cons is like geek church. It re-invigorates the nerd writer in both of us. The last six months have involved us bouncing from pneumonia to work-life crises to a move of three hundred miles and an absolute turnover of just about everything in our lives. I am, in fact, posting this as the last thing I will ever do seated at this desk, in this corner, from which I have written everything you’ve ever read here. So we lost focus, and there haven’t been posts since we did. That’s changing. We’re coming back. Look for a new review next Friday, and keep looking. There are so many good indie authors out there; we met them this weekend, and we’re going to tell you about them. For about the next month, you probably won’t be seeing reviews posted. We’ve just gotten our edits back from our editor on Coup de Grace, and we’ve got a month to turn and burn. Sue Bolich is an amazing author and a fantastic editor. She is also thorough, and we’ve got a lot of work to do over the next month, which means we’re on hiatus for a bit. Look for new reviews beginning on October 25. In the meantime, if you haven’t read Grace Under Fire yet, now’s the time. 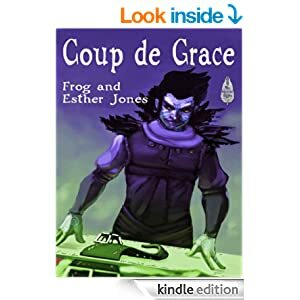 Coup de Grace is on its way to Amazon as we speak. This story was a fun, light-hearted, young adult romp that had its tongue placed firmly in cheek for much of the book. The main character Mildred, thinks she’s probably been born into the wrong family. She’s been raised by her four aunts, Opalisa, Lilith, Anklistine and Hurda, who are all black witches of well established ill-repute in the witching community. Her mother Drakin, was apparently the Valedictorian of Black Magic Academy, and died taking out her Death-Enemy (and Black Magic Academy Salutatorian) Welsa. Mildred doesn’t care about Death-Enemies, or curses, or luring hapless “Normals” into her garden to steal bewitched cabbages. She’d much rather read about heros and princesses, but the one time her aunts caught her reading “that trash” they’d threatened to burn it. Not that Mildred’s actually seen much of the world except for her aunts. Aunt Opalisa is the oldest and most powerful of her four aunts, and she rules the family with an iron fist. She definitely doesn’t allow male witches or “Normals” anywhere near the family stronghold of Ebony Drake. That all changes when Aunt Opalisa decides it’s time for Mildred to take her place at the the Black Magic Academy, like her mother and most of her aunts did before her. Suddenly, Mildred is plunged into a whole school of witches trying to be meaner, uglier, and more evil than anyone who’s come before them. Even worse, Death-Enemy Welsa’s daughter is in her dorm, and immediately declares Mildred as her own Death-Enemy. Mildred just wants to get through her classes without being cursed or running afoul of the teachers. That turns out to be pretty difficult– Mildred is the only person in the whole place that thinks “being nice” isn’t a character flaw. Plus, due to some jibing from her new Death-Enemy, Mildred finds out her father was a Normal. Could her father be the reason why she just can’t seem get the hang of this whole wicked witch thing? One thing’s for sure; she’s going have to be awfully careful if she wants to get through Black Magic Academy without getting expelled or worse. I had a lot of fun reading this one, and while can’t say it truly shocked me at any point, the constant “fractured faerie tale” references and the paradigm reversal away from traditional faerie tales kept me entertained all the way until the end. I have yet to meet a Pat MacEwen book that I haven’t immediately loved. While wildly different in both setting and feel from her last story we reviewed, The Dragon’s Kiss is no exception to that rule. I’m glad to report that this book also appears to be the first in a series, and I’m already waiting for the next one to come out. The story centers around Michael, a crippled boy who comes from a long line of dragon riders. The dragons and their riders protect his small village from the Qing empire, a much a larger force that used to enslave the people from his village to mine gold and other precious minerals out of the nearby volcanic hills. Michael dreams of flying a dragon himself, but since he’s wheelchair bound, has seizures, and can’t even communicate with the people around him unless he uses sign language, that dream seems unlikely to happen. He can’t truly measure up to the other cadets in physical activities, so he has to bear with the ridicule of his cousin and the other boys, and the cold disdain of his dragon-rider father. However due to the persistence and influence of his aunt, he is allowed to participate in some of the cadets’ lessons. He is out at the training grounds when one of the younger dragons goes berserk for no apparent reason. Michael hears a scream, and someone yelling in pain. The dragon breaks free of its handlers and charges right for where Michael is sitting in his wheelchair. There’s no way Michael is going to be able to push himself out of the way in time to avoid being trampled. In desperation, he pleads in his head with the dragon, asking it to please not step on him. To his surprise, the dragon actually swerves and barely manages to miss him. He starts to realize, that maybe the screaming in his head is actually the dragon’s cries of pain. He tries to get it to listen to him, because if they can’t get it under control any other way, the riders will put it down. There’s too much potential damage to life and limb otherwise. It’s in too much pain to pay Michael any attention. He yells in his head for help, and several of the adult dragons suddenly show up on the edge of the training grounds, crooning something to the younger dragon. It does pay attention to them, and at least stop thrashing and charging around. With their help, Micheal is able to find where a poorly tightened harness buckle has turned and cut a deep gash in the young dragon’s side. Disaster is diverted for the day, but no one can understand what just happened, or how Michael knew the young dragon was hurt in the first place. And with his clumsy tongue and rudimentary hand signs, Michael can’t explain it to them either, even if he knew what he was trying to explain. He’s not really sure what happened either. Have the dragons heard him? Is he speaking to them? And if he is speaking to them, why do they only appear to understand him some of the time? This was a totally engrossing read, and my only complaint is that it ended too soon. I definitely want more of these characters. I am very much looking forward to the next one. A.C. Flory has created a unique world for the Suns of Vohhtah series. She really, really has spent some serious time figuring out every last detail of this bizarre, alien world. Every season, every caste in her hierarchy, and every new, alien species has its own name. There is a hell of a lot of work that went into making Vokhtah a complete, detailed world. I really feel like I need to acknowledge that before I say what I’m about to. Here is the problem with this kind of rampant world-building: the author is the only one who’s done it. I wasn’t there when the seasons got their names, or when the weather patterns of the binary star system were sorted out. They were, and it is so cool that they were, but I wasn’t there when this nomenclature was generated. Yeah…that’s an understatement. The dense opening of this book will throw names, titles, castes, seasons, items, and everything else at you in rapid succession. Ms. Flory has spent so much time building this world that she has forgotten that her reader simply does not understand what is going on, and she hasn’t gone back to try to explain it to us. I’m fine with not inserting a human, but you have to do something to ease the reader into your totally alien world. It’s made worse by the fact that there are no personal names for the characters; it seems that everything is based on titles and position, and if you are the Blue then that’s what we’re going to call you. This does create a very strange, alien feeling, so kudos to that. But I can tell from the book blurb that I’m supposed to care about the Blue, and I just don’t. It’s only referred to by title, and it’s only referred to using the gender-neutral “it,” so I tend to think of the Blue and every last character in here as being so totally detached from me emotionally that I frankly don’t care if their world ends. Vokhtah is a stunning lesson to those of you out there who are world-builders. This is a really complete and totally alien world, and for the intricacy with which she built it I have nothing but praise for A.C. Flory. But Vokhtah is a terrible read, because you simply can’t bring yourself to care about the characters. The Blue is on its mission to cure the Six of this place, but the Six of that place will not be happy about that, and maybe the Yellow will try to interfere. There’s just no attempt to give us any sort of insight into these characters. A.C. Flory wanted to create something totally alien to us, and succeeded. But by not giving any human characteristics to her sentient creatures, she’s also alienated them from us. The fact that she prepped me for that in her e-mail tells me a great deal. It tells me that I am not the first person to comment to her on this problem; she’s aware of it. It tells me that she thinks her story would be watered down by the inclusion of some form of explanation, and it would be. But here’s the thing; what she has right now is a frozen can of lemonade concentrate. It’s too much flavor in too little space; watering down is exactly what it needs to taste delicious. Stop fighting against the people who are telling you how to make your book better. And the names. Dear God. Everything has it’s own cool name, and I love and hate that at the same time. Nothing is ever defined for the reader; it has to be pieced together from context clues, but those context clues are laden with other names. The icing on this cake is the names of the sentient races that inhabit Vokhtah. These are the Vokh, who are apparently the dominant race, though they may not be all that smart and they’re certainly homicidal. Vokhicidal? Now I’m doing it. Anyways, except during mating the Vokh will always try to kill each other. If a female Vokh gives birth, she will die doing so, so mating isn’t something that happens a lot. How the hell did this species evolve? We’re skipping over that. Anyways, the needs of the Vokh are seen to by…wait for it…the iVokh. Yes, that’s how it’s spelled. iVokh. I was not able to get through this book without seeing that name and immediately assuming that the protagonist was some form of Apple Product. It’s a horrible name; I have no idea what possessed A.C. Flory to do that to her readers. Vokhtah should be split up and scattered amongst the pages of a base book for a sweet, alien RPG. It would do very well in that, where the rules of the society are being laid out for the reader and the story is just flavor text. But it should not be read for entertainment purposes; what you will get when you read it is a headache, not a happy. I encourage A.C. Flory to write some sort of a prequel to Vokhtah. It doesn’t have to be a stranger-in-a-strange-land motif, but it has to ease us into the alien world she’s built. It has to let us see the things the iVokh have in common with humanity, so that we can form some sort of connection to her characters. I hate to see all the effort she put into building this world go to waste, but without a decently written story it will. Emerald City Dreamer is an interesting book. While borrowing heavily from traditional folk and fairytales, it is not by any means a traditional story. The author has set up three factions at the beginning of the book. The fae hunters, led by Jina and Sandy, believe all the fae are monsters who should be eradicated, and the seelie fae, led by Jett, seem mostly benevolent but have no problem placing geases or implanting false memories in humans. They also feed on the creative energy from special humans, known as “dreamers.” The third faction is a religious cult that attracts people who have been forgotten or abandoned by society, which a small street waif named Ezra belongs to. Not shockingly the three factions don’t get along, and the characters become trapped by their own decisions and the world view of their own factions. Because the author has so much to set up in each of these world views, it does take a little bit for the book to get rolling, but once it does, the latter half of the book takes place at a break-neck pace. No one is blameless in this book, and there are definitely no clear “white hats”, although there are one or two unredeemable characters. The book takes a long look at the unending cycle of pain and hatred that springs up between feuding houses, and the danger of becoming trapped in your assumptions. It even has a star-crossed relationship thrown in there for kicks. All that being said, I didn’t really like anyone in either of the main factions, and so I had a hard time being invested in the eventual grudging peace between the two sides by the end of the book. I also felt some of the betrayals inflicted on each other by the lovers were actually down played a bit too much, so they could stay together. Especially since, whether intentionally or not, those actions ended up in people being callously and almost casually killed. I think that would be a very difficult thing to overcome in a relationship, and yet these two clear that hurdle in less than a week. Which doesn’t make anyone any less dead. Still, the story is very worth reading, and a bit on the dark side. Think Grimm’s fairytales with a modern twist, not the white-washed and sparkly princess fairytale version. Frog may still do his Day 3 post, but I thought I’d take the time to throw some thoughts up here as well. Every time we go to a convention I am reminded how many amazing people we now call colleagues. It shocks me how far we’ve come in the last two years, but also reminds me how far we have to go. I got to go to some really awesome panels this year. I learned about exo-planets and current techniques for finding them from Jim Glass, Gary Bennett, David Nordley, and Alan Boyle. Going into it, I expected to hear quite a bit about adaptive optics, but that’s apparently still an emerging technology, so there’s not that much data yet. Instead I learned a great deal about the Kepler Spacecraft and the 700 some odd new planets it found before it broke (whoops). They have years worth of data to go through already, and they’re looking for ways to re-purpose it, now that it can’t really go seeking new planets. I also got to hang out with Jane Fancher, Wiishu, and Autumn Sims to learn about ball-jointed dolls. I had a ridiculous amount of fun with these little guys. If Frog isn’t careful we may be invaded by our own house elf. Wiishu is adorable, but I fell in love with Autumn Sim’s sculpture-like Gumiho and punk rocker. They’re actually the straw that tipped the scales from “really like” into “possible future obsession” for me. We shall see. Kaye and Cathy Thornbrugh, you are the best. I love you guys. Kaye did a reading from her second book Brightly, which looks like it will rock. If you haven’t read Flicker pick it up, so you can be ready. We also got a pretty convincing recommendation for the Cartoon Network show “Adventure Time,” and hung out with Mark Osier to make up scary, believable monsters. My last panel of the con was for “Dynamic Duos” with CJ Cherryh, Jane Fancher, and Phil and Kaja Foglio. Those are some Gamabunta-sized dynamic duos, and then us tadpoles. LOL. I think we did ok though. It’s really fun to talk to other collaborative couples and see just how many similarities and differences we share. Since SpoCon is the first scifi con I ever went to, it always feels like coming home, but this year– even with the bumpy start– I feel really, truly blessed. Looking forward to next year. Ok, I think I’ve recovered enough from Day 2 to discuss it. Opened up by playing a quick game of Forbidden Island, which was a hoot. What a great, fast, cooperative board game. Went right from there into a panel with the legendary Kaye Thornbrugh about the Kindle Worlds program, and the issues behind it. Expect a longer post from me in the near future detailing my thoughts here, because they are somewhat apocalyptic. While I’m on the subject of Kaye, I’ll jump out of order and say that we also caught her reading of Brightly, her next book. Kaye’s first book, Flicker, was actually the book that kicked off the Friday Indie Review. Brightly sounds like Kaye has really taken the next step. I believe she’s going to be launching it at Orycon, so anyone who’s going to be there make sure to read Flicker now so you can be ready for Brightly then. We also went to the Iron Fan panel, which was a subject of some dread. Rightfully placed dread. The winning team–the winning team–made us eat a top-ramen burrito. That was the best team. It was all downhill from there. I also got to give out the awards to the Writing Competition, which I judged. This was a hoot to judge, and there’s some good writers out there. I especially want to give a shout-out to Sanan Kolva, who needs to submit a novel. Her short story won, but I can tell by reading it that her real strength is going to be in the long game. This is an up-and-comer, so watch for that name. Esther checked out a panel wherein Jane Fancher played with dolls. I really don’t have words for that. Then we did the reading, which went well. This was the first time Coup de Grace made its way into the public. No, it’s not published yet; it’s not even fully edited. But we still busted it out for our reading, and it looks like it turned a couple of heads. Given that we only had a couple of heads in the reading to turn, that’s not shabby. So, off to Day 3, wherein we do the collaboration panel. On this panel will be the Foglio family, CJ Cherryh and Jane Fancher, and, well, us. What a panel this will be. I am also going to be on a panel about the role of government in space. This panel will feature me and a rabid conservative. I will also be on this panel with Erin Lale, the acquisitions editor for Eternal Press. For those of you who read Esther’s review of Remembering Love, you will understand just how interesting this panel should be. Let me start by saying this: going to Spocon is like coming home again. This is where our whole writing career kicked off, and it’s nice to come and give a little back. Day 1 of Spocon was a bit on the slow side. There was a really awkward meeting with a publisher, but we also got to hang with old friends, and make some new ones. Our schedule tomorrow picks up. I get to do a panel with Kaye about Kindle Worlds and the legal ramifications therein, and we’re going to have to eat weird stuff. So that should be fun.